Anyone who is anyone will know about the United Kingdoms decision to leave the European Union aka. Brexit, that has took the UK (and even world I believe) by storm, and my goodness what a storm it's been. A storm of lots of opinions, tempers, anger, elation and just about every other emotion you can imagine. I had so many feelings about the whole saga myself, I decided to write them down. Before I start probably what will be one of the most provocative posts I've written, just remember that this is a post with my own opinions and views, everyone is entitled to theirs and because I think a certain way doesn't mean that is the 'right way to think' or that everything I think is a fact. It's just my views and this is my blog where I'd like to share them. Firstly, I voted IN. It doesn't mean I think anyone else should of, everyone is entitled to their own views. Am I frustrated that the outcome wasn't the same as my vote - of course I am. But this isn't just something that we can think 'Oh well' this vote will have repercussions of epic proportions, and ones I believe will be incredibly detrimental to the United Kingdom. Quite a few of the Brexit campaigns were based on the abolishment of free movement if we leave the EU, something I completely and wholeheartedly disagree with. Both myself and John have family that have emigrated, and my parents themselves own a second home in Spain, I can't imagine how difficult it would be in the future if they wished to live out their permanently. Even the smallest of things such as, so often I hear and see people moaning about queuing at customs when leaving or entering the country, we're all familiar with the queue that moves much quicker when you've visited a country in the EU - that will be gone, no 'in and out' of the airport, but long laborious hot queues which selfishly when I have two young children, I'm not a fan of. I think often people associate stopping free movement with I quote something I hear far too often 'stop all the immigrants coming in'. Well my Nan is an Irish immigrant, lived in England since she was 10 years old, does that mean she should go back to Ireland - is she not 'worthy' of this country? My late Grandad, a Bajan, emigrated to England when he was 21, a six week boat trip and worked, earned and contributed to this country every day of his life till his retirement - would he no longer be acceptable here? I find it insulting, and I know not everyone who voted OUT for Brexit thinks this, but that people really believe immigrants are a disservice to our country. Don't get me wrong, there will be some who abuse the systems, but I'm more than certain we have enough English doing that themselves and quite frankly probably a hell of a lot more than immigrants do. Immigrants change lives for the better too, I'm pretty certain if an immigrant firefighter was rescuing you from a burning building you're not going to turn them away, so why do the same to them from our country? What if that midwife or doctor who noticed your babies reduced movements (or in my case that my waters had broken prematurely), was declined immigration into our country, where would I be right now, would I be grieving a son that never was? A video I find incredibly poignant is below, and I think it really hits home that we could be in a situation that many immigrants to the UK are today. Our country could be worn torn before we know it, our homes destroyed, families shattered and lives never the same - and I would never think that another country would discriminate against myself or even potentially my orphaned sons, because they had the 'latest clothes' or I owned an Iphone. People must remember that so many immigrants are coming here for a better life, they're escaping a life they once had that may have been perfect so they could have expensive clothing or technology - but living conditions have changed and they're seeking help. Who are we to decide they don't deserve that? I'm frightened for my sons, I'm worried that some people naively voted or didn't, because they didn't read the facts, that they believed the scaremongering and xenophobia in the press, that they listened to the likes of Nigel Farage and Boris Johnson (who backtracked on two of their biggest campaigns merely hours after the result) But what scares me the most is that I feel this choice, this decision by the majority of the United Kingdom will give racist and bigot minorities the gumption to act on their views, with the thought that the whole of the UK is behind them. 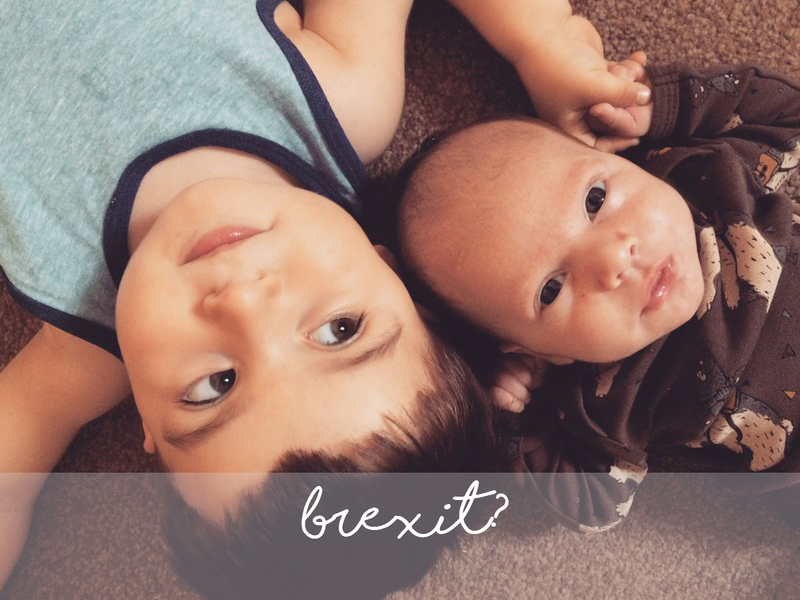 I will try to teach my sons to be accepting, understanding and fair and that ensure they're open minded about immigration as we were brought up to be. Because although so many other reasons have been stated and sugar coated, we know the biggest contributing factor and campaign towards the UK leaving the EU was immigration and I want to ensure that my children know that no matter somebody's nationality, skin colour, ethnicity, religion, sexuality, gender or age - they are human and we must use sense along with compassion to always, always remember that. I know it's been clearly indicated it was mainly the generation age 50+ that voted for Brexit, as opposed to those younger largely voting Bremain, and that really makes me sad. Everyone is entitled to vote, but I'd like to think if I was choosing something that wouldn't impact me, I'd listen to those it was going to impact and go with their views - as again, it wouldn't impact me. I wanted so much more for my boys and their future, and it's upsetting people who probably won't be around long enough to see the full repercussions of their actions have outweighed the ones who will & made a huge decision that will impact on their lives forever. They've effectively flipped a coin that won't land until they've gone and it's so sad and worrying to wonder what you boys might face because of that. I reiterate that I know not everyone who voted Brexit has extreme views, like I say - the minority. But it's such a heavy worry that I had to get it out there. Britain is leaving the EU and I'm not happy at the prospect. I felt sick when I read the result. It really does feel like bigotry and scare-mongering won out and we can't know the ramifications this might have for years to come. My only hope is that no leader will actually have the guts to implement article 50.